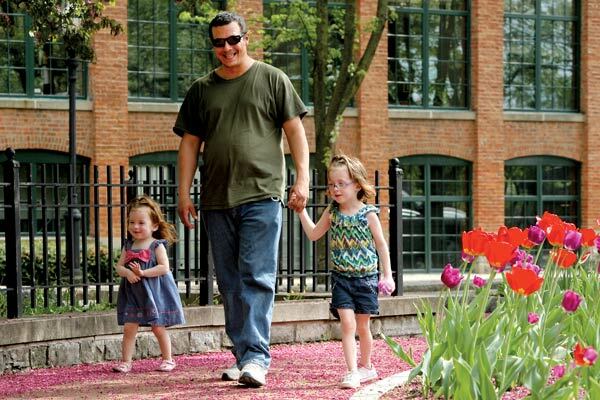 Real Dads of CNY - Family Times is an award-winning magazine with staff-written news, feature stories and artwork that inform and inspire Central New York parents and their children. These days, it’s socially acceptable to remain unattached into the middle-age years, and adults may feel less pressure from family and friends to find the right spouse in their 20s or 30s and start having a family shortly into a marriage. Others, on the contrary, look forward to having children just a few years into their adult lives. 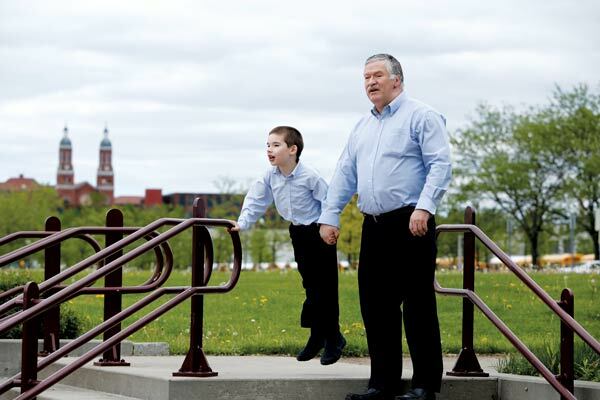 Four Central New York fathers from different walks of life recently discussed their parenting experiences. 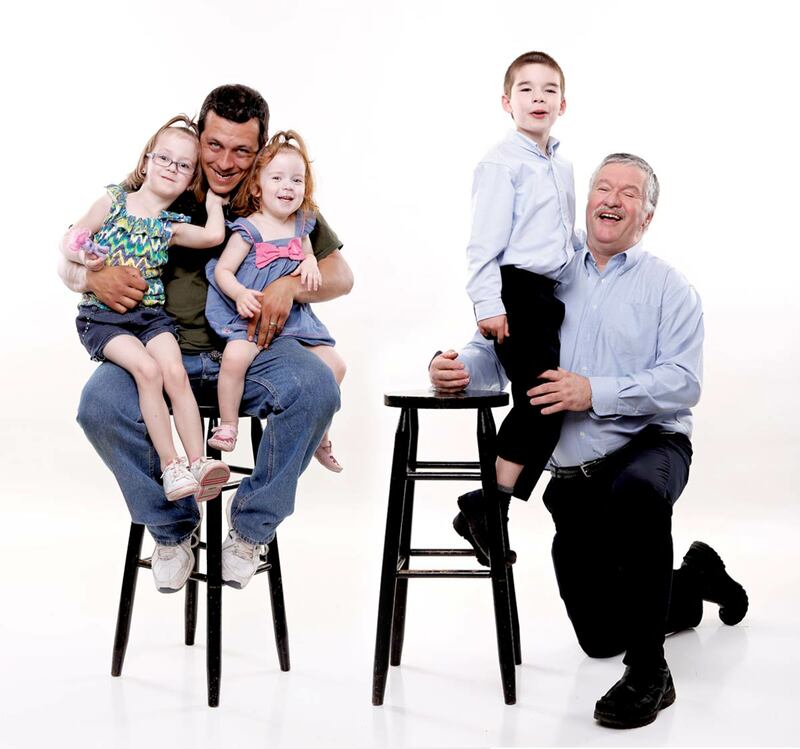 Regardless of when they had children, these dads have faced the varied challenges and rewards that parenting brings. Peter Banks, of Phoenix, will turn 58 in August. His son, Syd, is 6. Banks works as a registered nurse at Upstate University Hospital and is a regional representative for the nurses union. A native of England, Banks learned his trade while serving in the British army and is still in the military reserves, returning to the United Kingdom annually. His wife, Karen, 47, is from Wales and came to the United States to pursue a career in physical therapy. Why did you put off having children until you were in your 50s? We were late starters. Karen was working in a hospital and I was still in a training program. We liked it so much in the United States that we decided to stay, but we had to find a place (where we could both get jobs). We travelled around a bit. We were in Long Island, then Fort Lauderdale for 15 months. Eventually we came here and settled. What, in your opinion, are the advantages of having children as a middle-aged adult? I honestly believe that you have the ability not to get upset by the trials and tribulations of a youngster. You don’t feel so much pressure about doing the right thing. A 12-month-old crying his eyes out isn’t a great trauma. You just work with it. You see this with tantrums. You don’t lose your cool. There are some problems with this little thing they call aging (laughs). I can’t get around as quickly as a younger father. I have a detached retina caused by diabetes. And being older and not being from the United States, there are just some things I don’t understand, like T-ball. He loves it, but I have to learn how to understand it. How has your unique background helped to enrich Syd’s life? He’s gone to the U.K. with us 12 times so far. He is learning Welsh because all of his cousins speak it as their primary language. He’s a dual citizen, so if he wants it, he has the benefit of going to college (at a minimal cost) there at the age of 18. People say he’s growing up with an English accent, but I don’t see that. He’s an only child and he’s quite independent, but because of our experiences, he’s very outgoing and loves to reach out to people. He’s grown up with this sense of freedom to express himself. 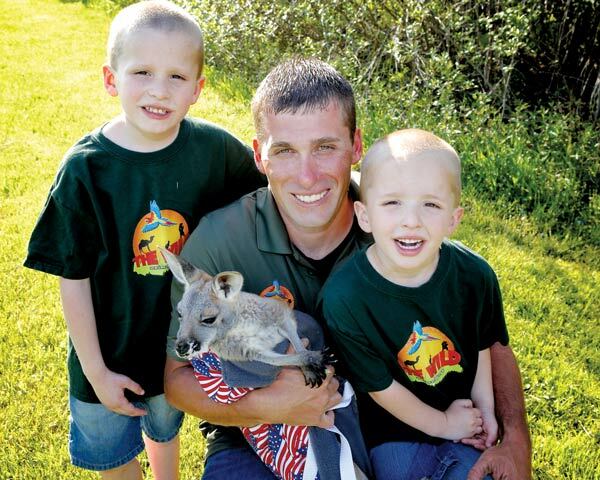 Jeff Taylor, of Chittenango, was in his mid-20s when sons Holden and Brody were born; their mother is Shannon Taylor. Jeff Taylor is 32, and the boys are 8 and 6. Taylor owns a landscaping company and a wild animal park, which evolved from a small petting zoo that he built as a gift for his firstborn. Why did you decide to have children at a relatively young age? I always wanted children and at that point I knew I was ready. I was lucky enough to have my own house and my own business, so I guess I was prepared for it as well as anyone could be. You spent a lot of time on the family dairy farm growing up. Do you think that prepared you for parenting? Yes. I learned about work and responsibility, which I try to teach to my sons. My dad and granddad taught me that a real man is a family man. I was able to bottle-feed calves and even take care of orphaned raccoons. Plus it was a lot of fun. I learned that having animals around is important to providing a great childhood. What are the challenges of being a young father? If you are focused on a career, then you need to work as hard as you can when you are young enough to do that. So you’re juggling a lot of hours. But I want to give them as much time as I can. It’s a lot to juggle. I feel like I’m young. I’m more energetic. I’m a parent, but I feel like I’m their (sons’) best friend. Having them adds to the most exciting time in your life when you are in your 20s and 30s. How has the zoo shaped their childhood? Because some of these animals can be dangerous, they’ve had to learn about safety at a young age. They’ve also had to be respectful of the public and know how to interact with people. They’ve become very friendly, very personable boys. And they’ve become obsessed with animals now. If they get upset, sometimes that’s what they need to calm down. Even at home, they are building zoos out of their figurines. Phil Oakes, 30, has two daughters—5-year-old Molly Rose and 2-year-old Lily Ann—with his wife, Sara. Oakes, who has recently embarked on a career as a truck driver, says that he had more than a decade of child-raising skills under his belt before he reached his mid-20s. Why did you feel you were mature enough to be a father at the age of 25? My father was always on the road working, and my mother had some issues. She really needed my help. I had to grow up very quickly. I had two younger sisters who I basically raised. I had to do whatever I could to make sure they got what they needed. Do you think there might have been any advantages in waiting a few years or even several years to have children? Nope. When you’re in your 20s, or your 30s, you’re more physically fit. I’ve been able to work jobs that involve hard labor. And you’re still young enough to change careers—like driving a truck. I can stretch myself thin because I’m young enough to do it. If you don’t try something before you get too old, you don’t have to worry about regrets later on. Were your parents relatively young when you were born? My mom was, but my dad was well into his 40s. He had diabetes, a couple heart attacks, and had to keep (working) when he wasn’t in the best of health. Even though he was gone a lot, I still respect him for what he had to do. What has been the most challenging part of being a father so far? I’m still trying to get established in a career. When they were younger I had been turned down for jobs because I didn’t have experience. You want the respect that comes with being a father, but when you are young you have to overcome the stereotype of that generation that just wanted to party, that just wanted to play games. But I can also understand that. There are a lot of people from my generation that went the wrong way. What advice would you give to other young fathers? Make sure you are willing to give up any greed you have. Anything material—feel that you are ready to give that up. I’d go without food, sleeping, clothes on my back as long as my kids didn’t have to go without anything. And spend as much time with them as you can while you are still young. Andy Hazeltine, 50, had his first child, Logan, when he was 44. Two more children, Ocasio, 4, and Sophie, 3, followed. Hazeltine, who is married to Jennifer Hazeltine, has worked as a Syracuse city school teacher and varsity soccer coach for 28 years and says he will most likely be retired before his kids reach high school. He discussed the benefits of not rushing into marriage and family. What were the circumstances that led you to have kids later in life? I didn’t get married until I was 44. It just never happened. I wasn’t in any hurry. I was happy being single and I let things happen. Jennifer is 11 years younger than me. We were initially told we couldn’t have children. We went through three rounds of fertility drugs and one miscarriage. We decided to stop putting pressure on ourselves. We looked into adoption. Then, lo and behold, there was one, and then two. The doctor didn’t want to do any more C-sections, so we stopped after three. We couldn’t be happier. What were the benefits of waiting? I was more of a parent. I had lived my life and had my fun. I didn’t have to be selfish. I wasn’t going to miss any crazy nights out. I’m coming up on retirement in a few years. I’ll get to be Mr. Mom. What has been the most challenging part of being a middle-aged dad? I’m getting older and I get tired. You have to find the energy somewhere. Our youngest daughter has a severe form of epilepsy and needs a lot of care, so I have to be ready. I grew up in a single-parent household without a dad, so I always promised myself that I would be a father that’s around for his children. How did working as a teacher and a coach for so long prepare you for fatherhood? Well, I taught high school and middle school, so I’m not sure it has yet. But what I can tell you is that they moved me from high school to middle school three days before (the birth of my first child). Normally that would be upsetting, but I had very little time to be upset. Having kids puts everything into perspective. Now, working in a school as someone who has children of his own, the main idea is I want to make sure my kids value education growing up. How do you relate to other parents your age? (My wife and I) talk about that a lot. Our social life has taken a hit and we do get a little bit homebound. A lot of our friends have older kids, and some that are even grown and out of the house now. I’ve never felt jealous or looked at it like I’m an older guy stuck with kids. They’ve (friends) all done great jobs as parents, and I’d like to think we’re doing a great job. That’s what it’s all about.